The third season of campus program Samsung E.D.G.E. has been concluded by Samsung India. There were over 2,500 of the brightest students from 18 top institutions across India who participated in the campus program. MICA Ahmedabad’s business school team called ‘Jenga’, comprising of Kanchan Supekar, Sruthy Whence and Jyot Singh Gill wer declared as the winner at the national finals in Gurgaon on December 03, 2018. ‘Overmorrow’ team from National Institute of Design, Bangalore came second. The third prize was given to ‘Deadweight Loss’ from Indian Institute of Technology (IIT) Madras. This year 2,553 students comprising of 851 teams from 18 leading campuses from all across the country participated in the program. The competition that happened over a period of over three months, saw students participating from domains like B. Tech, Masters of Business Administration and Masters of Design. Eight teams which won at the regional rounds qualified for the keenly contested national finale of the Samsung E.D.G.E. program this year. The winning team received a prize of INR 4 lakh and each member got a Galaxy Note9 smartphone while the team that came second got a prize of INR 2 lakh. The third team received a prize of INR 1 lakh. All the 8 teams that reached the national finals received Samsung vouchers worth INR 10,000. The main aim of the platform is to give students an opportunity to interact with the leadership team at Samsung, work on real-world business problems and come up with unique solutions. This year, the top 8 teams worked on the premise ‘Samsung –a brand of choice for millennials’. The Samsung E.D.G.E. program consisted of four rounds. In the first round, team members came together and put up an executive case summary. Top team members were then invited to participate in the campus round and presented their ideas through group presentations. After evaluation, top teams in each campus were shortlisted for the Regional Round in which all the teams worked on the case study and presented their unique solutions. At the end of the regional rounds, top 8 teams were selected and mentored by Samsung leaders on their respective solutions. These 8 teams battled it out in the National Round to arrive at the three winning teams. 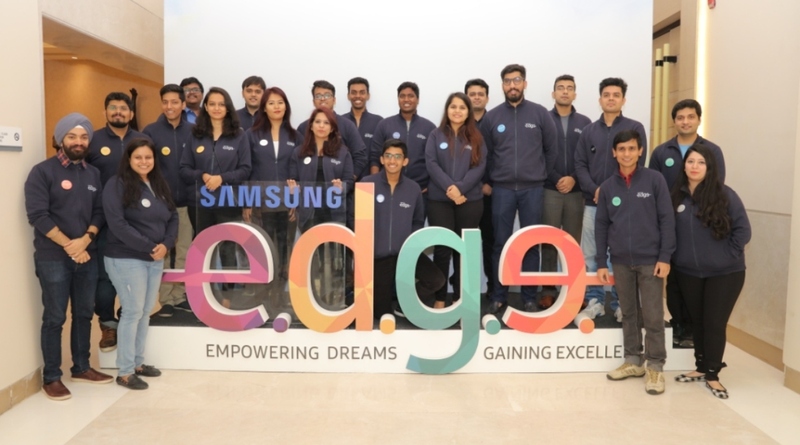 In the current hiring season, Samsung India plans to hire close to 1,000 graduates from top Indian engineering colleges to strengthen its R&D operations in the country. Third Season of Samsung E.D.G.E.